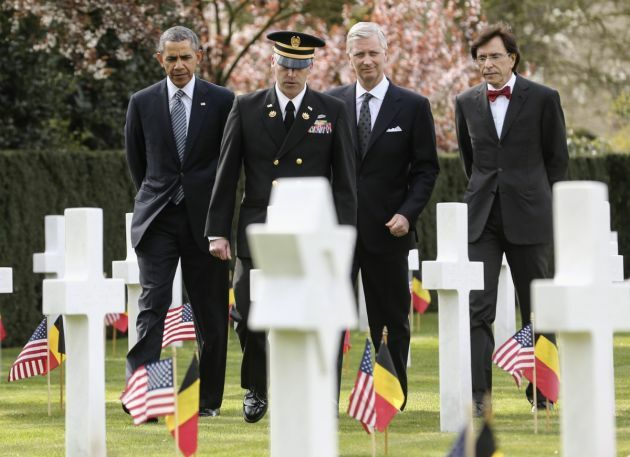 (Photo: REUTERS / Olivier Hoslet / Pool)U.S. President Barack Obama (L), Belgium's King Philippe (2nd R) and Belgium's Prime Minister Elio Di Rupo (R) visit the Flanders Field American World War I Cemetery and Memorial in Waregem March 26, 2014. Obama is on a one-day visit to Belgium where he will attend a EU-USA summit and hold a speech. VATICAN CITY (Reuters) - Despite differences on moral issues, U.S. President Barack Obama will find in Pope Francis a welcome ally on issues of poverty and social justice when they meet for the first time at the Vatican on Thursday. The president has sparred with the Catholic Church hierarchy in the United States over his support for abortion rights, gay marriage and the "contraception mandate" that requires employers to provide health insurance cover for artificial birth control. But Francis, while making clear that there will be no changes to Catholic doctrine on such issues, has used softer language than his predecessors. In taking some of the heat out of the issue, he has tried to focus the Church instead on helping the world's disadvantaged, and signalled his dislike for the polarising effects of "culture wars" among U.S. Catholics. "Francis has made it clear that his emphasis is on poverty, immigration and other social issues," said Monsignor Robert Wister, theologian and professor of Church history at Seton Hall University in the United States. Since his election a year ago, Francis has several times criticised unbridled capitalism, the excesses laid bare by the global financial crisis, and the growing gap between the rich and poor, even in developed countries. For his part, Obama has repeatedly praised Francis for his compassion and emphasis on helping the poor, and the meeting could help to give impetus to some of his initiatives back home, such as boosting the middle class and helping low-income Americans succeed. The White House said Obama wanted to discuss "pressing global challenges such as lack of economic mobility and opportunity," adding that the pope's voice was "a crucial one as we look around the world at areas of conflict, religious persecution, and poverty". Francis' more open-minded attitude toward women and gays also resonates with Obama, who counted on both groups to help propel him to the presidency in 2008 and 2012. Catholics were also an important constituency for his re-election and remain a key group for Democrats, who are hoping to hold on to the U.S. Senate in November's midterm elections. When Obama met then-pope Benedict in 2009, Benedict raised abortion, a touchstone issue for many U.S. Catholics as the Church considers abortion a grievous sin. Obama promised to do everything he could to reduce the number of abortions. U.S. Church officials want the pope to visit the United States for a meeting of Catholic families in Philadelphia in 2015, and Obama may extend an open invitation, a U.S. Church official said. Obama, a Christian who has attended African-American churches in the past, has kept his religion a mostly private affair, rarely attending church in Washington since his election in 2008. He receives daily "devotional messages" from an informal spiritual adviser, mostly based on Scripture.